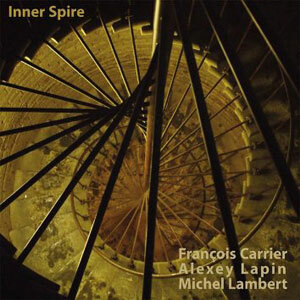 Inner Spire with François Carrier, Michel Lambert and Alexey Lapin. True as it can be how easy a musician involved in public funding can become so prolific, and obviously starting with no point in blaming Carrier for that – real problem is, how much it is difficult usually for a musician sponsoring such projects – the urge to document this relatively new trio is more than comprehensible. What’s more, the compositions on Inner Spire are so different in mood and substance – Inner Square is a sweet and intense struggle for squeaking horns, lyrical piano chords and drumming barrage, ‘Square away’ is built on piano heavy clusters, tightroped horns and swirling brushes, Tribe a more meditative weaving, with Round Trip perfectly coupling and preparing while climaxing in order to introduce the last, openly meditative Sacred Flow, with almost impressionistic piano statements and more dissonant breaks – that one wonders if, even if being Carrier music more defining that suggesting, it can be correct to put him between two of his most famous partners, Uri Caine, post-modern but straight, and Mat Maneri, less melodically defined but equally committed with stretching sound into space.